What are the new regulations?From April 2016 all dogs in England will be required to be chipped and owner details must be kept up to date. Fines of £500 will be in place for non-compliance. Breeders will be responsible for getting puppies chipped and registered before they leave. New owners will have 21 days to register the pups with the appropriate database. A small microchip which is about the size of a grain of rice, or smaller depending on the breed of dog, is inserted below the skin via an injection. This chip carries a 15 digit number which can be read by a scanner used by Local Authorities and vets. This number can be identified on a database which holds the owner’s details. Of course, this is only useful if owner details are correct. It is essential that if you move house, or change your contact numbers you notify the database company to keep them up to date so that your pet can be reunited with you as soon as possible. The cost of chipping will vary. Remember that the chip insertion is a one-off charge, handled by a vet or welfare centre. The chip itself will cost between £10 and £30, plus normal consultation charges. Look for special offers at RSPCA or rescue centres. The breeder of your puppy should have had them chipped and you will just need to get them re-registered with your name and details. There will be a charge for this which will vary according to the database provider. 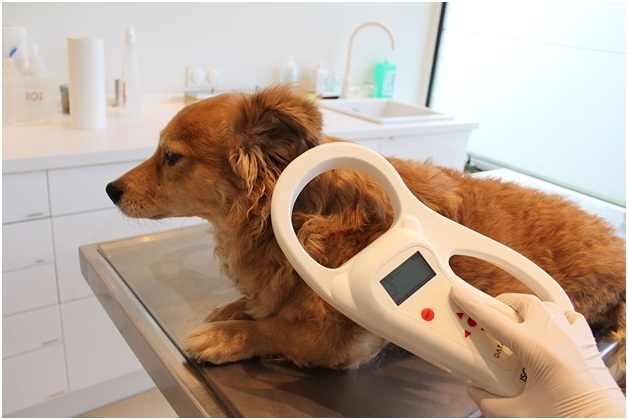 Perhaps your next doggie day out could start with micro-chipping, followed by some compensatory dog grooming in Cheltenham by Blossoms Pet Care. Both are demonstrations of your affection but he or she will enjoy the second one rather more! 5. What will be achieved with the new regulations? The new regulations are being introduced to try and reduce the number of stray dogs, the owners of which cannot be identified. Over 65% of stray and lost dogs have traditionally been non-chipped. Of those that are chipped, over 40% carry either incomplete or incorrect owner details. It is hoped that with these new rules, the microchip will allow lost dogs to be returned. In addition, dogs involved in attacks will be traceable, and the owners will be held responsible.